Poppies Day Nursery have helped Gusto make poppies for the Knutsford Proms Event. GUSTO on King Street will be taking part in the Promenades on Saturday after having a little bit of help from youngsters at Poppies Day Nursery. The restaurant is staging ‘Al Fresco’ outside dining as well as a poppy First World War floral display from fellow town business Knutsford Bloom. Poppies day Nursery was asked to help the restaurant to make some poppies for the display. 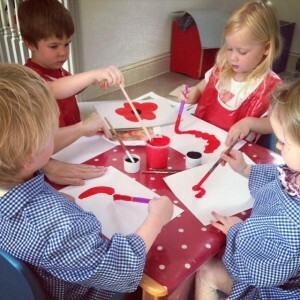 Stef Meachin, business development manager, at the restaurant, said: “We are delighted that the children at Poppies Day Nursery, are helping to create some beautiful paintings to add to our World War One display ready for the Knutsford promenades.